This is the second post in a series focusing on involving students in the assessment process. For the first post, click here. In continuing to include students in the assessment process, I am exploring methods of self-reflection and peer editing, as well as open to suggestions that I hope other educators will share with me. For our second quiz, I had my regular Algebra II students edit their own quizzes. First, I had them take the quiz as they normally would, and I made marks (in blue) only if the problem was incorrect. I gave no scores. Then, the next day I handed back the quizzes, along with a green pen, to each student. 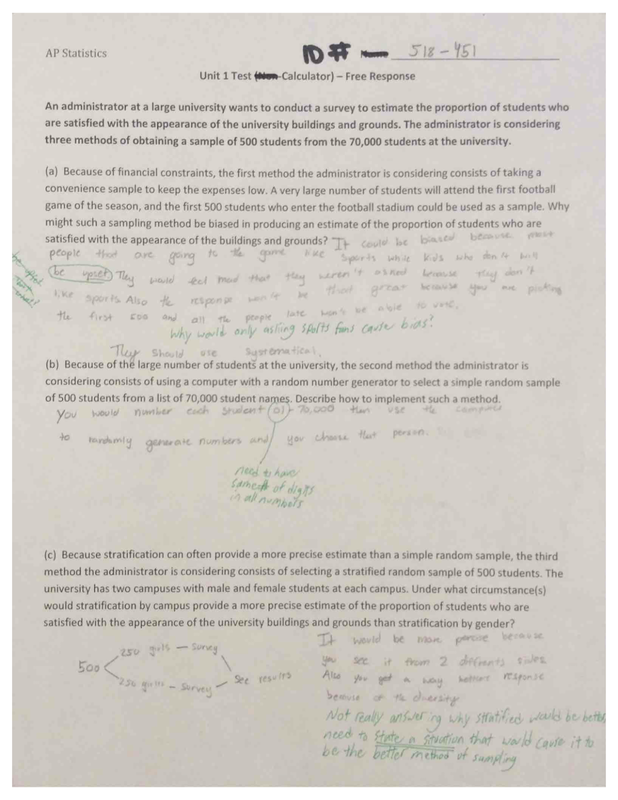 Students corrected the problems that they got wrong in the green pen. The conversations were awesome! The topic is simplifying radicals, so it is common for students to make silly mistakes or make the same mistake throughout all problems. 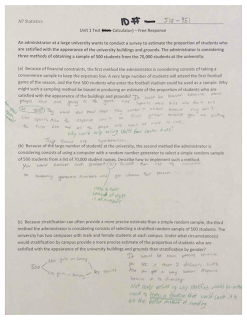 Many students quickly realized what they did incorrectly and were able to make the necessary adjustments to their work. For the students who struggled on this topic more than others, I was able to give them more one-on-one instruction to better understand this topic. I loved this activity, and I'd rather not call it an assessment. I feel that the students learned so much from being given a "second chance." The struggle that I have is that I am obligated to report something in the gradebook. 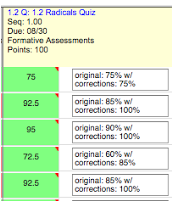 This year, I am only reporting summative unit test scores towards students grades, so all quizzes are going in the formative assessment category in the gradebook (a 0% category). Because of this, I had some flexibility on how to report this to be as informative as I wanted. For the score, I averaged the two scores, and in the comments section, I reported both the original score and their edited score (as seen to the right). I LOVE the comments section! I'm continuing to explore new methods to build a positive learning experience and student self-reflection from the assessment process. I would love to hear any ideas that you have as well, so comment here, tweet at me, or stop down in the Collab Lab!